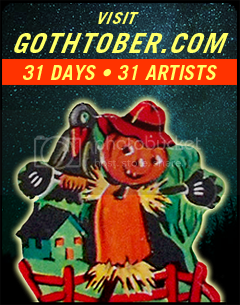 Visit www.gothtober.com and click on DAY 18 for an avant-garde cinematic EVENT! Spoiler alert: It has BALLOONS. I guess that’s not much of a spoiler, since the word “Balloons” is in the title. Duh. There’s a Columbian balloon man, and a professional tumbler who looks kind of like a kid… wait… that IS a kid! It’s a kid in Los Angeles! The score is original, played with a real theremin and real cello. It gets more and more ominous the more you watch, we may never know how that balloon man feels. The alienating effects of modernization are felt in this arresting film, Fellini surely would agree. For anyone who participates in Gothtober every year, it’s absolutely the kind of pressure some artists dread. Taking part in Gothtober means you are expected to deliver some kind of art, while facing intense public scrutiny, on a constricted schedule, while simultaneously having to deal with your own day-to-day obligations, work and personal relationships! Can you feel the angst? We think Del Norte had some good fun, with much success!